Sampling the best mac and cheese in New York is a challenge not to be missed. Many New York restaurants cook up great mac and cheese for you, and really put their own spin on this traditional, simple American dish. What makes New York’s mac and cheese so special? In New York they love to incorporate special ingredients to the dish, such as fried onions, bacon, a breadcrumb crust or even pork, mushrooms, fennel and peppers. Here, I’ve put together a list of the best mac and cheese restaurants in New York, see how many you can try. S’Mac: I discovered this restaurant that exclusively sells mac and cheese in the heart of Manhattan’s East Village. It’s a great place for a cheese-a-holic. In this restaurant you can find all kinds of variations on the traditional dish. How about a Spanish version with Manchego and fennel? Or the buffalo chicken mac and cheese, which is a mix of chicken, cheddar and American cheese with a generous portion of buffalo wing sauce, bursting with spicy flavour. Choose from four sizes: nosh, major munch, mongo and partay. The latter being really, really big. Cheese and wine is a famous combination and they certainly prove this at Murray’s Cheese Bar. In this place you can enjoy the signature mac and cheese with a glass (or two) of paired wine. On their dinner menu they have three options: The classic mac and cheese, which comes with Spring Brook Farm’s Reading cheese, Comté & Irish Cheddar topped with breadcrumbs. You can order this for lunch or dinner, and when ordering it at night, you can also order it ‘family style’ and share it between four people. Another option is their pulled pork version, with pimento cheese and English Tickler Cheddar. Or ask what their seasonal mac and cheese is when you are there. Besides mac and cheese, you can choose the popular Cheesemonger’s choice plate. A plate full of different cheeses, some cured meats and fresh bread. The Cheesemonger will personally serve the plate and explain each item. They take their cheeses right from their cheese caves beneath Bleecker Street. The bar is open for brunch, lunch and dinner and they also serve an intermezzo of cheese courses during the afternoon. The food here is good, but expensive. Westville is a local mini-chain with locations in SoHo, East Village and Chelsea. It’s a small place, with a homey feel to it. The menu features simple but high quality American food. Their smokey mac and cheese has plenty of flavour thanks to the the restaurant’s signature ingredient: smoked Gouda béchamel. It arrives hot and steaming, with a nice crust on top. Make sure to add the optional extra, crispy bacon. Expect a bit of a wait, especially during peak hours as it’s very popular with the locals. Beecher’s is a cheese store and cafe in one, located in the flat iron building. In their glass-walled cheesemaking kitchens you can see, firsthand, their centuries-old craftsmanship. They are the proud producers of many award winning cheeses including the Marco Polo Reserve, Cheese Curds, Yule Käse, Flagship Reserve and 4-year Aged Flagship. You can grab a sandwich at their cafe and watch the cheesemakers at work or head downstairs to their restaurant and cheese cave: ‘The Cellar’. 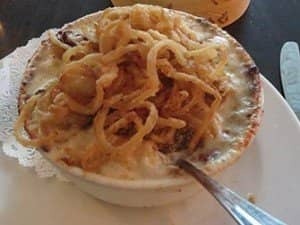 Order the mac and cheese, which they claim to be the ‘World’s Best’ and comes in a number of varieties. I can assure you that it’s definitely good. You can enhance it with extras like pork belly and pickled fennel stem ($15), crab, old bay aioli and bread crumbs ($16) or balsamic mushrooms and fennel ($13). Or even go for curried cauliflower and sweet onion ($13) or ,if you prefer your mac and cheese with a little kick go for kale and mama lil’s peppers ($13). I think the simple, original world’s best ($12), is worth a try on its own. It lets the flavour of the famous cheeses really shine. It might sound odd to recommend a steakhouse, such as STK here but, trust me, their Mac and Cheese is definitely worth a try. Served as a side dish, it is a nice addition to your steak. Even if you consider mac and cheese as casual comfort food, don’t forget to dress up for STK. You can always continue the evening in the clubs around the Meatpacking District. Eric’s Tip: A lot of places offer mac and cheese as a starter or side. Order this to share so you can sample it without stuffing yourself.